Vendor: Foxit Software Sold by: Amazon Web Services, Inc. 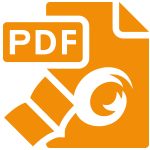 Whether you're a consumer, business, government agency, or educational organization, you need to create, read and annotate PDF documents and fill out PDF forms. You need your PDF Reader to be - Fast so you're not waiting forever to read files, lightweight so it's easily deployable and doesn't exhaust system resources, and secure so you don't get infected with viruses and security to keep your sensitive information safe.